If you’re wondering about the wish list of policies behind the Tea Party rhetoric, ponder these snapshot examples of the positions of two newly-elected, Tea Party-supported Members of Congress, drawn from an Associated Press piece by Charles Babington (link here, via Yahoo! News). In southeast Florida last week, first-term GOP Rep. Allen West, a tea party favorite, called for changes that some might consider radical: abolish the Internal Revenue Service and federal income tax; retain tax cuts for billionaires so they won’t shut down their charities; stop extending unemployment benefits that “reward bad behavior” by discouraging people from seeking new jobs. Does this Congressional newbie not understand that we simply don’t have enough good jobs (i.e., those that pay a living wage) to go around? Does he realize that tax rates on the wealthy already have plummeted from their high point during the post-WWII era, when America’s economy happened to be at its zenith? Hey, let’s stop brainwashing these kids! OK, I get the debate over government-sponsored health care, but this guy is suggesting that public education somehow is wrong??? This is a very different Republican Party than the one that once hosted the likes of Senator Mark Hatfield of Oregon, Representative John Anderson of Illinois, and — going further back — Governor Robert LaFollette Sr. of Wisconsin. We are dealing with folks who want to take us back to the 19th century, and that’s no exaggeration. Voters are electing extremists who want to do away with the very safety net that many of them would want to access if they found themselves facing hard times. They are empowering those who want to eliminate retirement and disability benefits and to privatize education. The Tea Party folks are pushing the GOP off the deep end, and I’m afraid they’re willing to take a lot of everyday Americans with them. Finding a job in these recessionary times is hard enough, but what happens when employers decide to rub a little salt into the wound? As their searches for employment stretch on, some job seekers are getting a rude awakening from the companies they apply to. Nearly a third of the executives surveyed online by search firm Korn/Ferry International said candidates aren’t being treated respectfully by prospective employers. Some of America’s less-than-wonderful employers (and staffing agencies, too) are refusing to hire the unemployed, even to the point of listing current employment as a requirement in job announcements. The Equal Employment Opportunity Commission, the federal agency that enforces workplace discrimination laws, recently held hearings on this emerging phenomenon (link here) in light of possible discriminatory impact on older workers, women, and people of color. It’s not just lousy employers who are out to punish the unemployed. At a time when there are not enough jobs to go around — let alone jobs that pay living wages — Michigan Governor Rick Snyder enthusiastically signed into law a six-week reduction in unemployment benefits for those without work, claiming this will spur job growth by minimizing the unemployment tax burden on employers. These dots connect. It’s all about kicking people while they’re down. It’s part of a culture of cruelty — or at least pathological insensitivity — towards those who could use some respect, a helping hand, and hopefully a job. I’ve just had the privilege of spending several days with members of the New York Public Employees Federation (PEF) at their annual health and safety conference in Albany. It was a welcomed reminder that — at least on occasion! — even a hotel conference center can be the site of a big dose of inspiration. A 100th anniversary remembrance of the 1911 Triangle Shirtwaist Factory Fire featured readings by Jemma Marie Hanson (PEF), Kristina Willbrant (PEF’s very able conference coordinator), and Maureen Cox (NY Dept. of Labor). I was especially pleased that two fellow Bay Staters, both affiliated with the Massachusetts Nurses Association, made the trip to Albany to lead a program on working with law enforcement authorities to address workplace violence. Christine Pontus, RN, opened with an informative presentation on how changes in mental health treatment policies over several decades have put health care workers in harm’s way. Ellen Farley, RN, detailed her brave, persistent, and ultimately successful efforts to spur a Massachusetts prosecutor’s office to deal with a serially abusive patient who had committed some 55 reported assaults in a single year. They were followed by members of the local district attorney’s office who gave a useful mini-tutorial on the criminal offenses most likely to arise out of violent situations involving patient behavior. PEF is taking workplace bullying very seriously. They are educating their membership about this phenomenon and supporting the Healthy Workplace Bill before the New York legislature. In fact, my role was merely to explain how their extensive efforts relate to the broader national and international movement to respond to workplace bullying. It was heartening to talk to so many PEF members who already had taken time to learn about workplace bullying and to apply this knowledge to addressing situations at work. The PEF Health & Safety Department deserves a warm round of applause for putting together this successful gathering. Thanks especially to director Jonathan Rosen, whose long-time commitment to addressing workplace bullying and violence led to this speaking invitation. We’re hearing a lot about state budget crises right now. Some of these concerns are serving as smokescreens to launch a virulent assault on public employees and the right to bargain collectively, as we’re seeing in Wisconsin. Don’t be fooled about the true intentions behind these attacks. Those who had the good fortune of taking part in this conference experienced why good unions are so threatening to those who want to consolidate power and wealth: First, there is strength in organized numbers. Second, the core meaning of worker solidarity is good people helping other good people to improve the work lives of all, not just the most fortunate few. No wonder why some folks would prefer that unions simply disappear. We have to do everything we can to ensure that will not happen. Hopefully he’ll be back at us again soon. I included links to previous Herbert columns in this post, Jobs, Unemployment, and the Great Recession. The tragedy led to legislation covering worker health and safety, spurred the growth of the American labor movement, and shined a light on working conditions of those toiling in sweatshops in the nation’s cities. 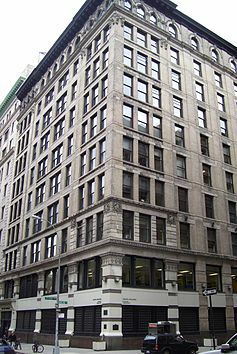 The fire occurred on the 8th, 9th, and 10th floors of this building, located just east of Washington Square Park in Greenwich Village, Manhattan. 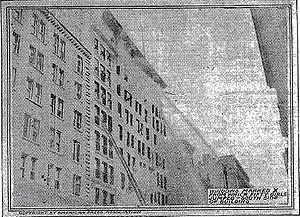 The photo on the left is a contemporary view looking at the building’s south side, from which some 50 women jumped to their deaths rather than face being burned alive. I recently walked by the building and gazed upwards. Other than two modest plaques marking the historical significance of the building and the fire, there is no visible evidence of the tragic event. On a nice fall or spring afternoon, with the Washington Square area alive with students, tourists, and locals enjoying the day, it’s hard to imagine the horror of what happened there. I don’t know whether that’s a good or bad thing. The Cornell website (link to front page, here) is a treasure trove of information about this tragedy, and I highly recommend it to anyone who wants to learn more about what happened. PBS recently aired American Experience: Triangle Fire (2011). HBO is airing Triangle: Remembering the Fire (2011). Do the “seven stages of hate” help to illuminate mobbing behaviors at work? Schafer’s full post — which elaborates on each stage — is worth printing out and reading. For example, when a coworker, for various reasons, becomes a hate target, the hater immediately seeks out others in the office who dislike, or can be persuaded to dislike, the hated coworker (Stage 1). This observation dovetails with the findings of a 2006 study by professors Nathanael Fast and Serena Chen (reported on this blog), indicating that “power paired with a lack of self-perceived competence” can lead to aggression at work. Noa Davenport, Ruth Distler Schwartz and Gail Pursell Elliott would build on Leymann’s work in their important 2002 book, Mobbing: Emotional Abuse in the American Workplace. Hat tip to CiviliNation for the Schafer blog post. The term “underground economy” typically suggests something irregular, perhaps even shady or illegal. But in a piece for Yes! magazine (link here) drawn from her recent book The Moral Underground: How Ordinary Americans Subvert an Unfair Economy (2010), Boston College sociologist Lisa Dodson writes of everyday Americans who are bending or breaking the rules, fueling a “moral underground economy” to help others in need. They found a little opening, a little chink in the system, and used it to treat working people better. Even if they had to break company rules, they were determined to treat people as though their survival mattered in a business environment that valued nothing but bottom-line profitability. “Bea” is a big-box chain store manager who somehow ordered an “extra” prom dress for an employee who couldn’t afford to buy her daughter a prom dress. Of course, the very term underground economy often obscures the real motivation for working off the books or bending the rules to help people who are struggling to make ends meet: Good jobs at decent wages are in terribly short supply, and available public assistance doesn’t bridge the gaps. The upshot of Dodson’s examination is that in a nation where minimum wage laws do not mandate a living wage, where public assistance is inadequate, and where the gap between the most and least fortunate continues to grow wider and deeper, practicing simple morality becomes a form of humanitarian civil disobedience.